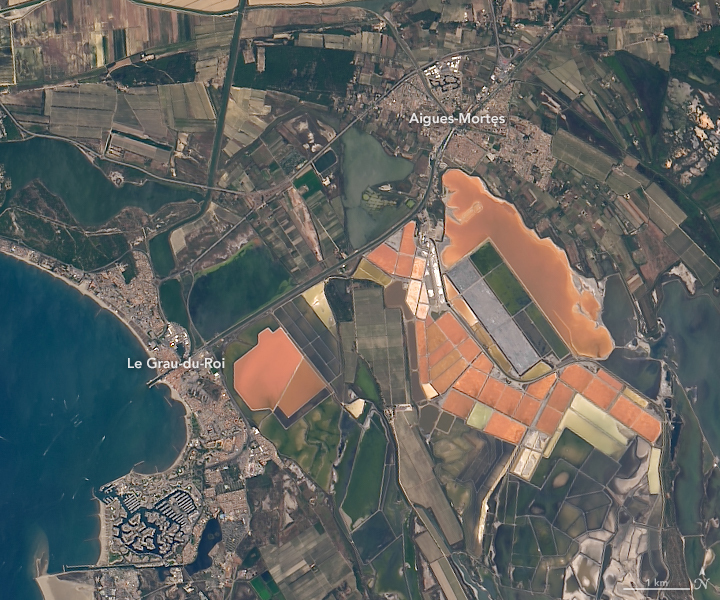 Since antiquity, workers have harvested salt from the tidal marshes of Aigues-Mortes, France—a coastal Mediterranean town steeped in history. 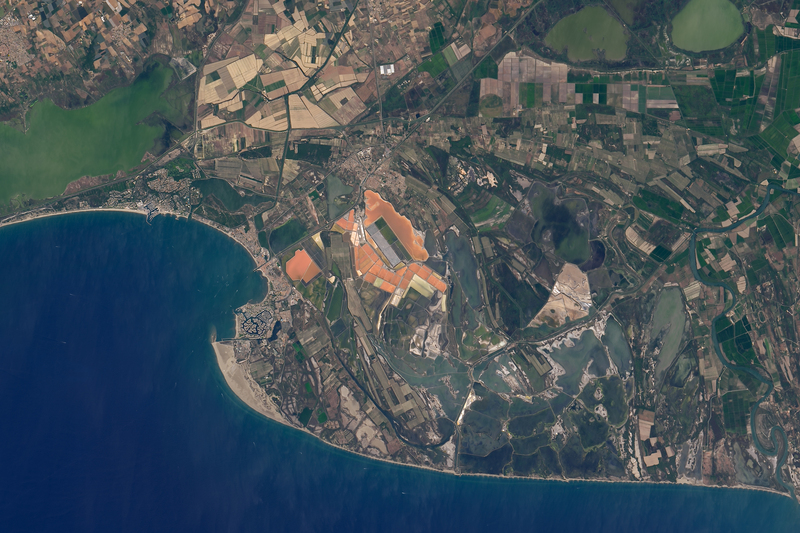 Today, salt remains an important industry here, and satellites can provide a bird’s eye view of the vibrant production process. 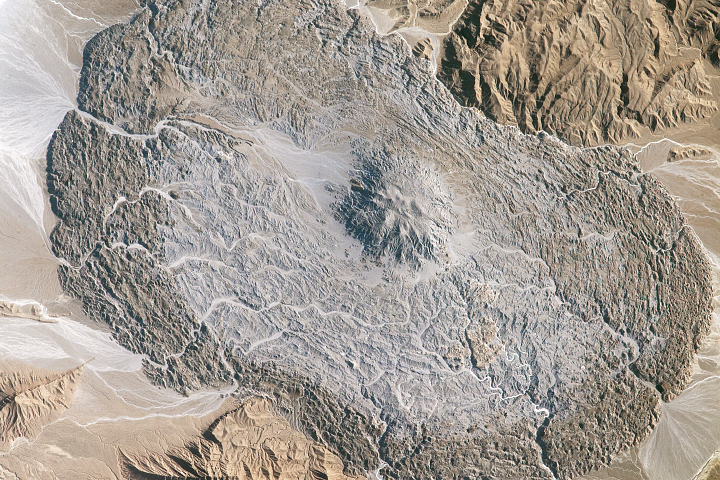 The Operational Land Imager (OLI) on Landsat 8 acquired this natural-color image on August 20, 2018, around the time of peak harvest. Salt from nearby marshes is mechanically harvested for industrial, chemical, and pharmaceutical uses. Salt marshes at Aigues-Mortes also produce a culinary delicacy—a fragile, flaky crystal harvested by hand. The production begins in spring, when the weather is most favorable for the process. Tides bring relatively fresh water from the Mediterranean inland and workers carefully manage the flow through a series of canals. 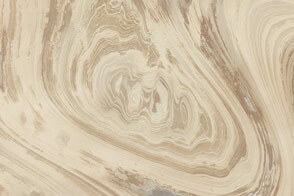 Ample sunlight and light winds promote evaporation and make the water progressively saltier. The final, super salty mixture is eventually spread over a clay pond, where the water’s surface becomes saturated with flower-like crystals of fleur de sel (French for “flower of salt”). Throughout August, workers quickly harvest the salt before rain and humidity can destroy the delicate crystals. 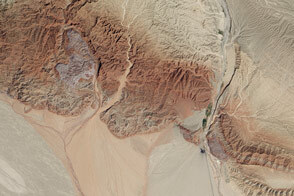 Salt is indirectly responsible for the rosy color of the water in the satellite image. It turns out that only a few hardy lifeforms can thrive in this salty environment. 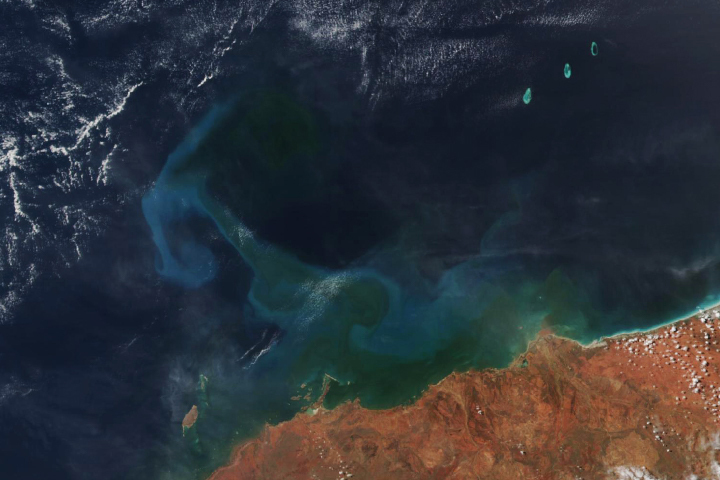 They include a beta-carotene rich phytoplankton Dunaliella salina, and a pink Halobacteria. The pigment trickles through the food chain: the microorganisms feed colonies of brine shrimp, which in turn feed the region’s large population of flamingos. 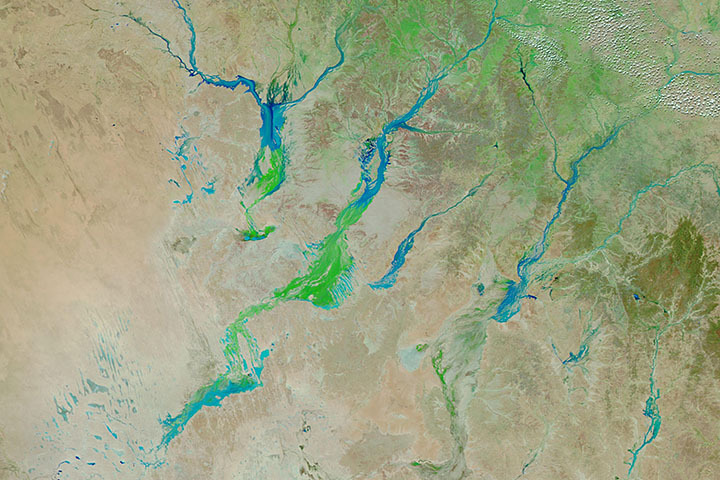 NASA Earth Observatory image by Lauren Dauphin, using Landsat data from the U.S. Geological Survey. Story by Kathryn Hansen. The salt produced from tidal marshes in southern France is the product of ideal climate conditions and careful management. Atlas Obscura, Salin Aigues-Mortes. Accessed April 3, 2019. Avignon & Provence, The Saltworks of Aigues Mortes in the Camargue. Accessed April 3, 2019. De Wit, R. et al. (2019) Seventy-year chronology of Salinas in southern France: coastal surfaces managed for salt production and conservation issues for abandoned sites. Journal for Nature Conservation . Magic Measured in a Pile of Salt (2012, August 27) Magic Measured in a Pile of Salt. Accessed April 3, 2019. Munchies (2017, January 3) Collecting the World’s Finest Salt in the ‘Dead Water’ of France. Accessed April 3, 2019. Oren and Dubinsky (1994) On the red coloration of saltern crystallizer ponds. II. Additional evidence for the contribution of halobacterial pigments. International Journal of Salt Lake Research 3(1), 9-13. Salin d’Aigues-Mortes, Learn everything about the Salt Marsh. Accessed April 3, 2019. Solar Salt Works & The Economic Value of Biodiversity (2014, June 4) Proceedings of the International Conference. Accessed April 3, 2019.